Aquaman Poster Bonanza: It Can't Be This Fun, Can It? 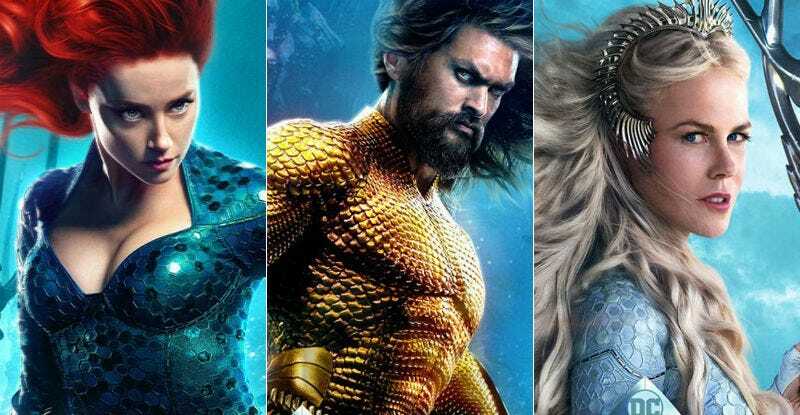 Mera, Arthur, and Atlanna in posters for Aquaman. Seven new posters for Aquaman were just released, each one so bright, bold, and goofy, it has us wondering...is it possible? Is it possible director James Wan has made a movie worthy of these images? A movie so over-the-top exciting and crazy that it feels like the living comic book seen in these posters? Posters so dazzling they would make Lisa Frank let out a rainbow-dolphin shriek of excitement? I think we have to say “yes” to all of the above. It’s very possible and we won’t have to wait long to find out. Just look at these posters. The vivid colors, the striking poses, the flowing hair...this movie looks bonkers. Now, of course, these are just posters and not actual stills from the movie, but if they truly capture the vibe Aquaman is going for—wow, we are looking forward to it even more than before. Wan recently revealed that he’s finished with the film, which means screenings will start to happen worldwide leading up to the December 21 release. Soon, we’ll know if it lives up to these posters.